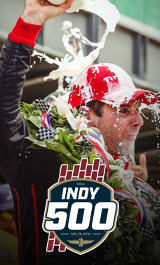 The day before 33 drivers race 500 miles for glory at the Indianapolis Motor Speedway, Legends Day presented by Firestone honors the immortal names and machines of more than a century of the Indianapolis 500 on Saturday, May 25. This special day in the Month of May features autograph sessions with current and past drivers, historic car laps and multi-platinum, Grammy Award-winning Zac Brown Band headlining the Firestone Legends Day Concert. Chart-topping country artist Carly Pearce and Clayton Anderson have been added to a star-studded lineup. Are you looking for $10 Drivers Meeting tickets on Legends Day? Those tickets, which do not include concert access can be purchased here. Kids 3 and under are admitted free with a paying adult. No coolers allowed. No chairs. This is a standing room only show. *Concert pit ticket includes full General Admission access. No seats. No coolers. This is a standing room only concert pit. One parking pass per vehicle, not per person in the vehicle. All cars MUST be moved 2 hours after the concert concludes. Cars will be towed that are left after that time.